Years ago, I discovered how eye-popping delicious metallics were on certain papers, especially black. It took me a while to find the a black paper I was looking for, one that was soft to the touch and had warm and elegant qualities to it. I was also looking for one that didn't leave behind water stains, a common problem with black papers. Once I found that paper, I was off and running. I marbled with metallics on lots (and lots!) of papers...and then I shifted focus and didn't marble with them as much. Then came Instagram. And I found my way to Brazilian marbler Renato Crepaldi, who is a huge fan of using metallics (and I believe he makes his own paints even), especially on black paper. Totally re-inspired by his work, I stepped into the studio and played with my dear old friends again; and it was just like any good, strong relationship...we picked up right where we left off. I've listed a few of my favorites in my shop, if you're interested in purchasing these beauties. 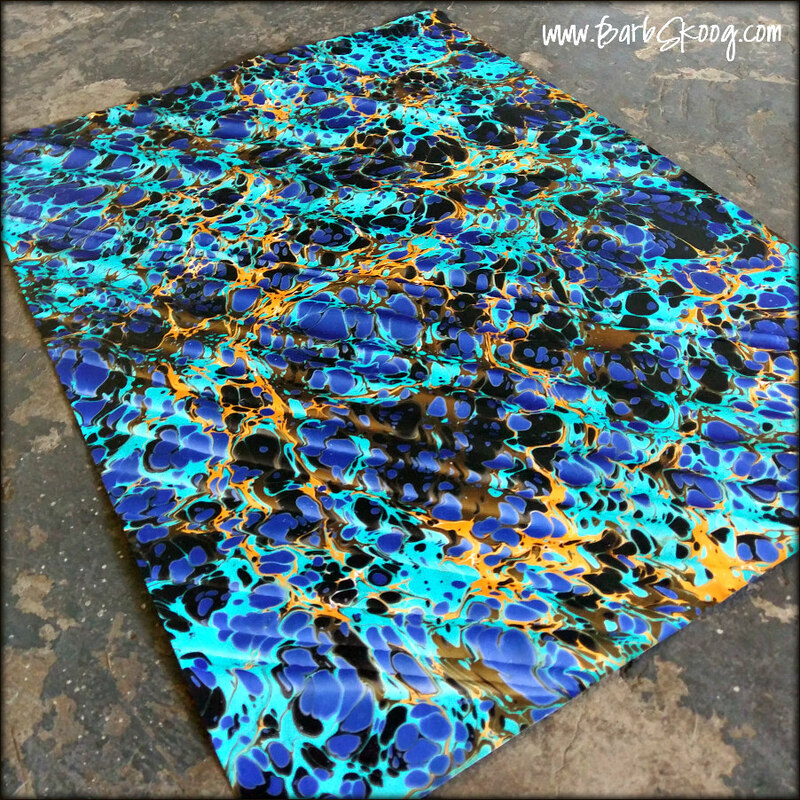 As always, there is free shipping anywhere in the U.S. on marbled papers. I still get all giddy and awe struck when I pull something from the bath. 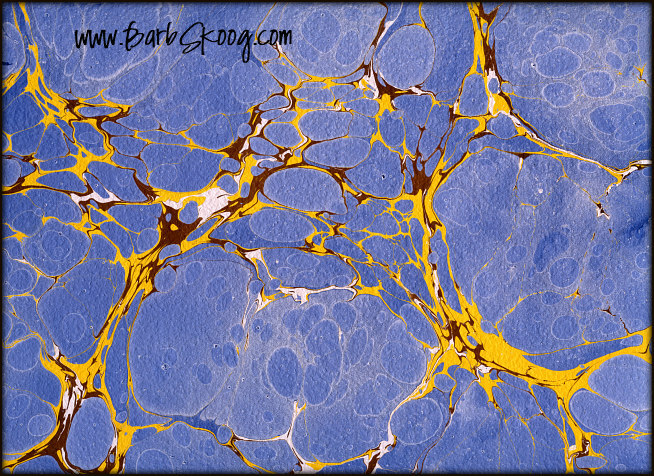 That's the beauty of marbling ~ every single piece is truly a unique surprise that never gets old to experience over and over again. But every once-in-a-while, "the reveal" takes my breath away and leaves even me a bit WOWED (more than usual) off my feet. 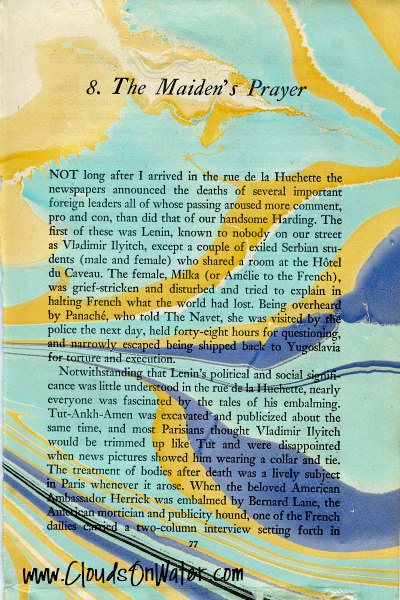 That was this piece. I love it. And I love it hard. I can't stop looking at it. It's for sale in my shop...and if you like it, you better snag it before I change my mind. 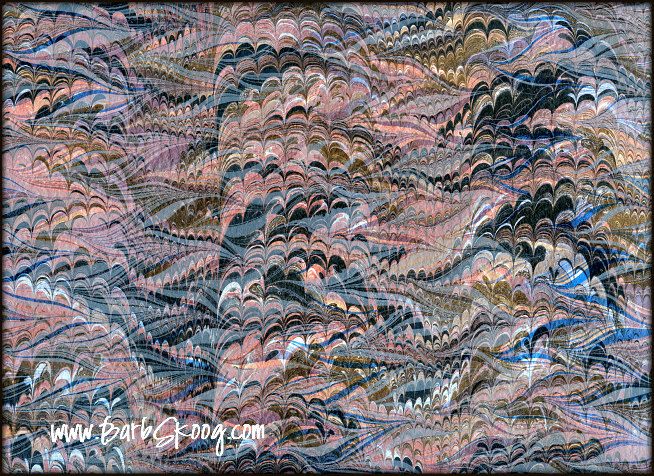 Yes, this is marbled paper, NOT marbled fabric. Pretty cool, eh?! 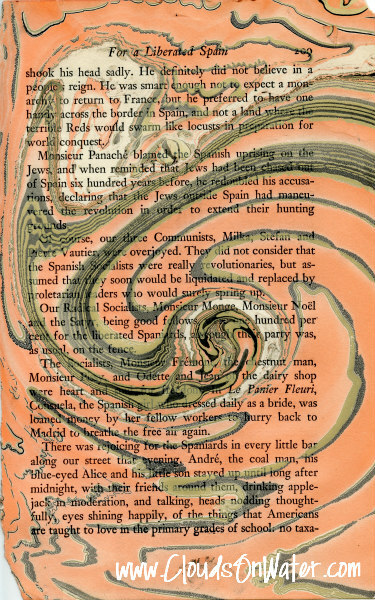 Always a fan favorite, the Spanish Marble creates the illusion of ripples across the paper. I like to think of it more as a technique than a traditional pattern since it is about how the paper is laid down and not about a series of strokes. 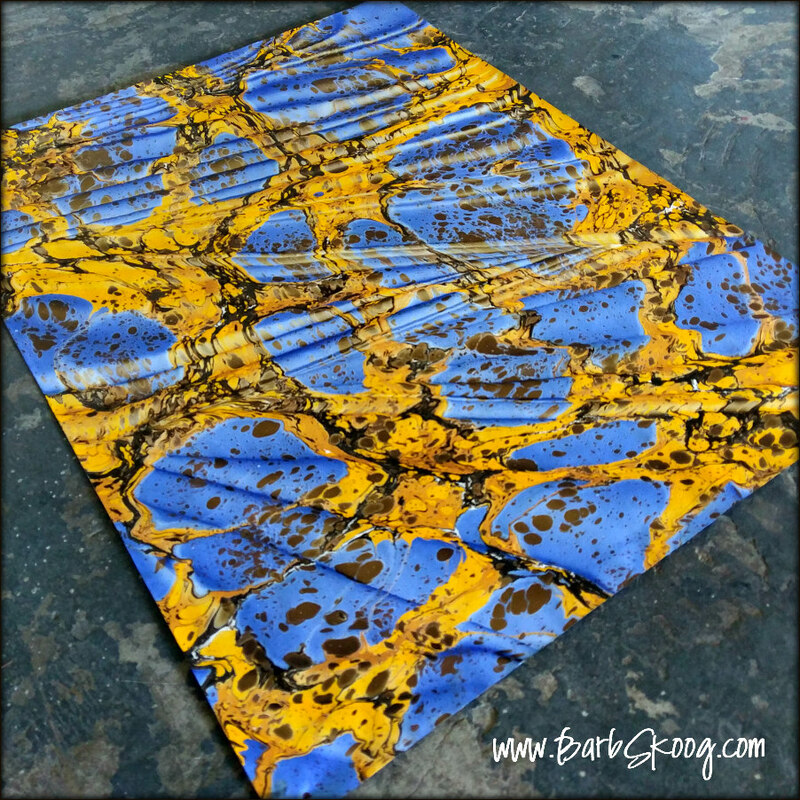 Students had a blast learning this technique in the Advanced Marbling class I held in my studio this past weekend. 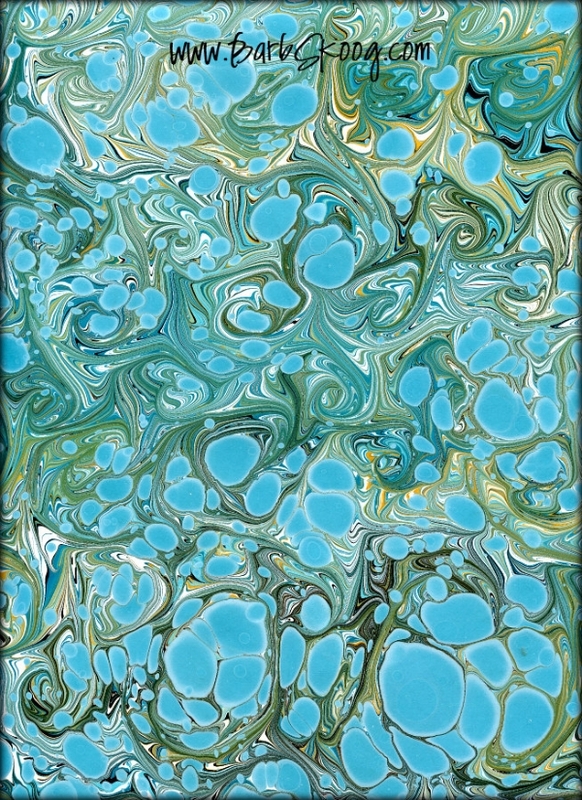 I also teach it in the Advanced Marbling Techniques classroom of my online course Clouds on Water. It's not a complicated technique to learn...but it definitely is a touchy-feely one that requires some insider tips and then some practice to get it down. 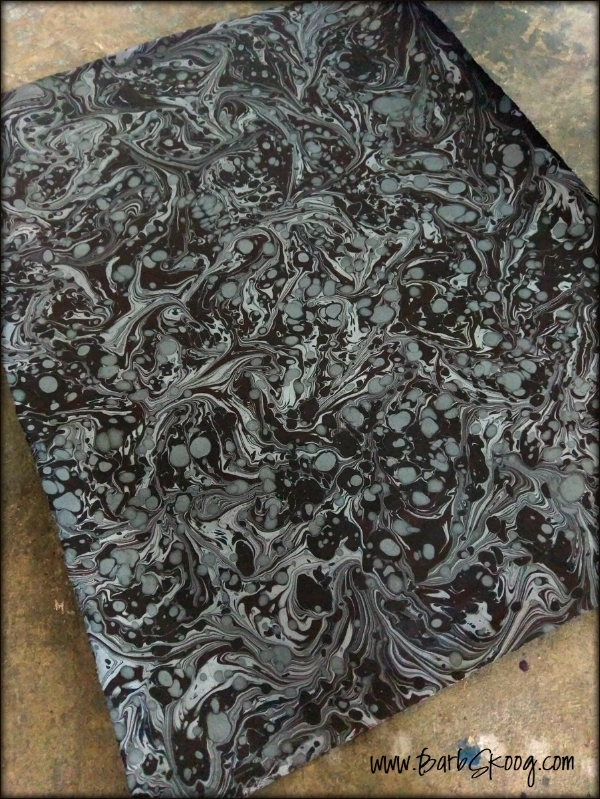 Spanish Marbles are wickedly wonderful to see in person and when famed, they add some serious spice to a room! 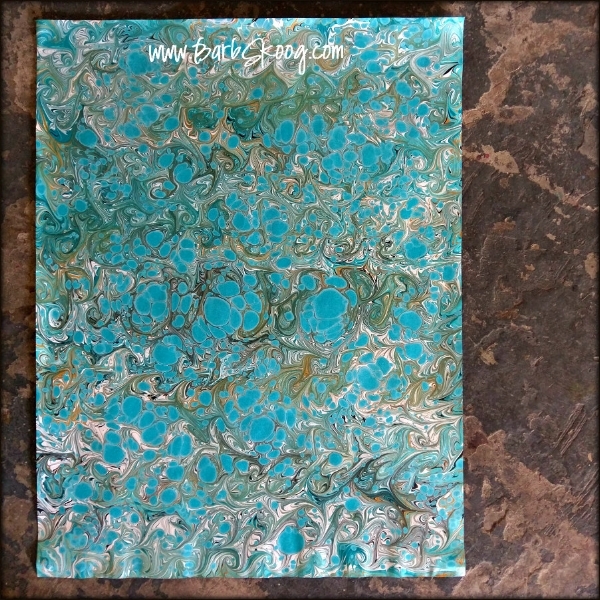 Or you can use them for the cover of journals or other creative projects you're looking to jazz up. I just updated the shop with these fun guys so head on over and grab one for yourself. 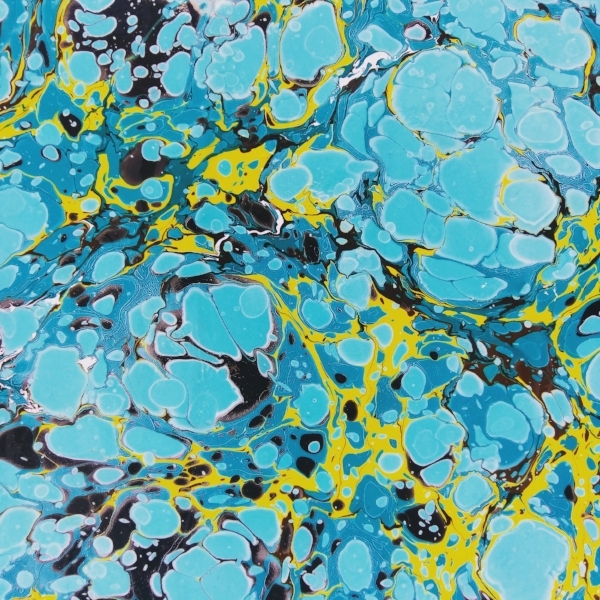 And as always, there is FREE SHIPPING on all marbled papers. 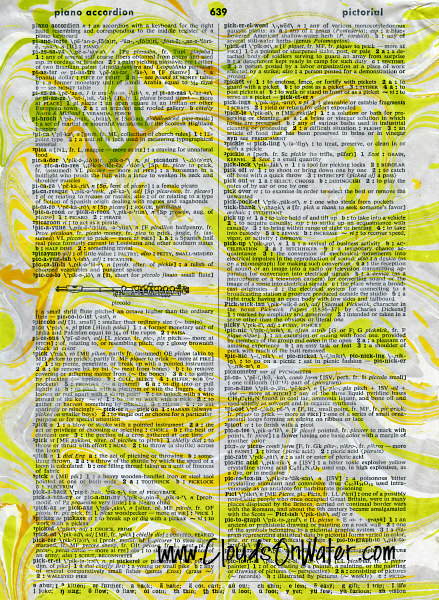 I absolutely love marbling on old book and dictionary pages (and maps and handwritten letters and ledgers too!). 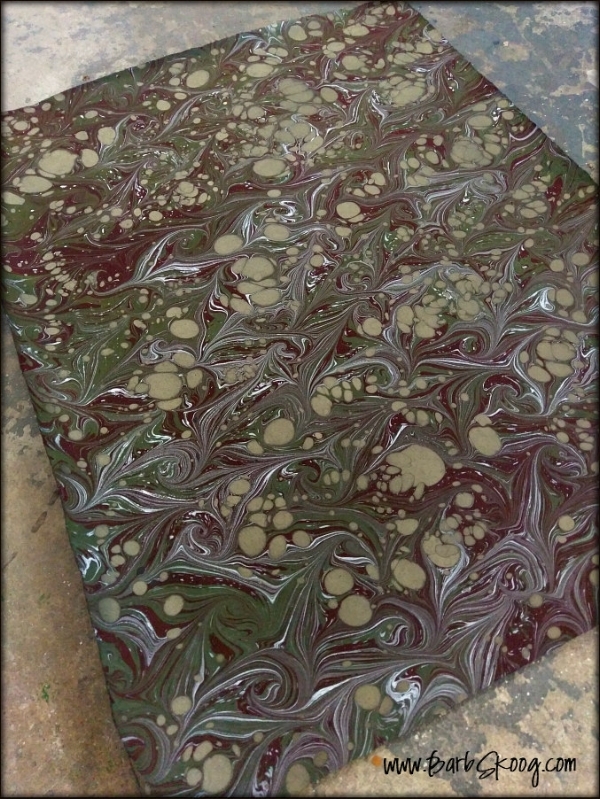 Sometimes I use them to pick up "ghost prints," or the leftover paint in the bath from the original print. 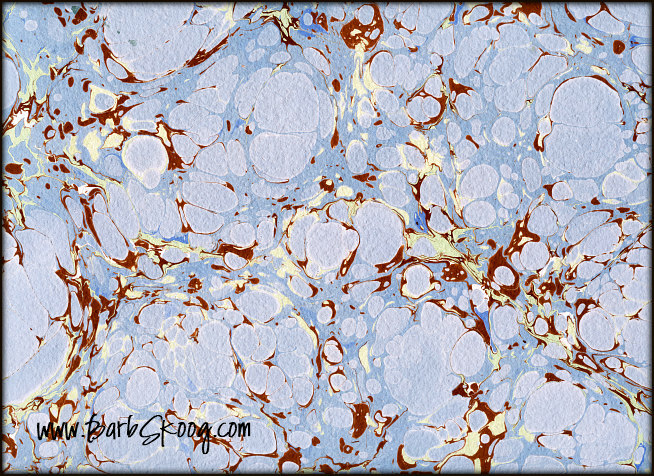 But sometimes I set out with colors and patterns that match the specific personality of the page I am marbling on. For me, the point isn't to cover up the beauty of the printed page...it's to complement it...which means I have to be strategic in my colors, design, and intensity. 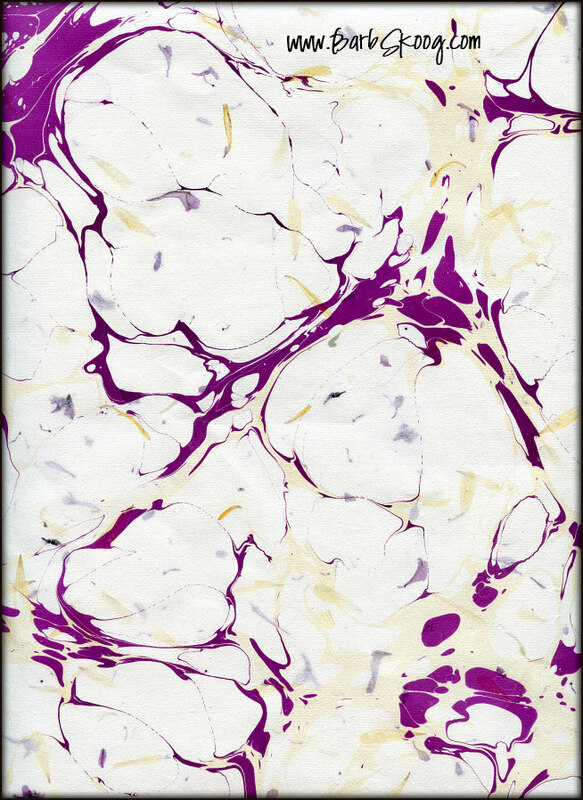 My most recent round of scrap packs include some of these marbled pages. 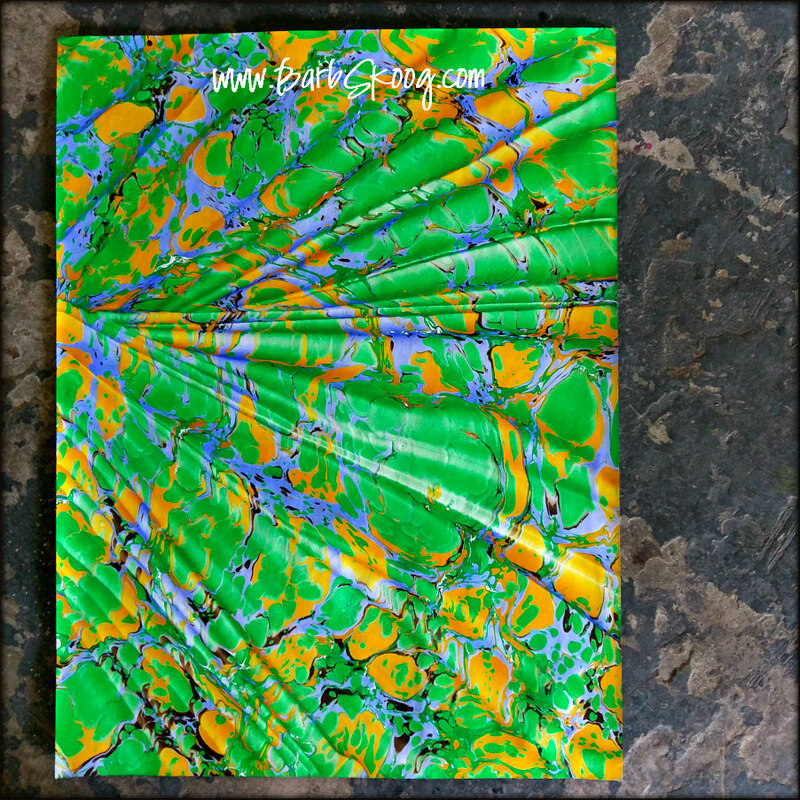 Head on over to my store to get your marbled bag of goodness...and remember, FREE SHIPPING on all marbled papers, including scrap packs! I don't know a single artist who doesn't, at some point (and possibly at many points), think, "Does anyone really connect with my work or does it just resonate with me?" And when moments like that hit me, my initial reaction isn't to dismiss the thought. My initial reaction is, "And who better to resonate with your artwork than you, Barb?" I create because I need to. Because every bone and cell in my body is anxious and agitated and spinning madly unless I do. But it's also incredibly satisfying to see one of your pieces in someone's home or to have a gallery invite you onto their walls. 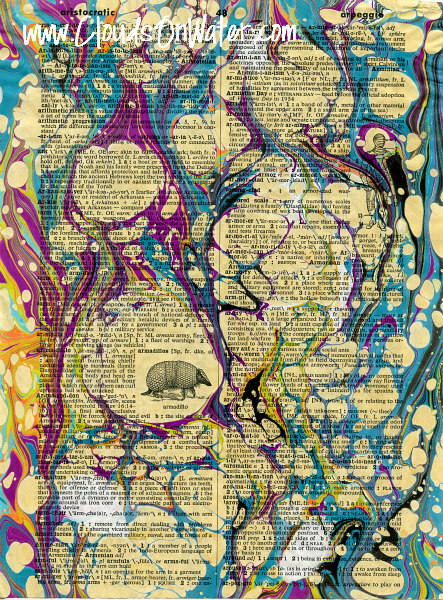 I am so excited to have one of my CELLULAR STORIES pieces accepted into Las Laguna Art Gallery's group show, UNIQUE ABSTRACTIONS. Featuring local, national, and international artists, the show runs from May 4 to May 27, 2017 with the artist reception Thursday, May 4 from 6:30 p.m. to 9:30 p.m. 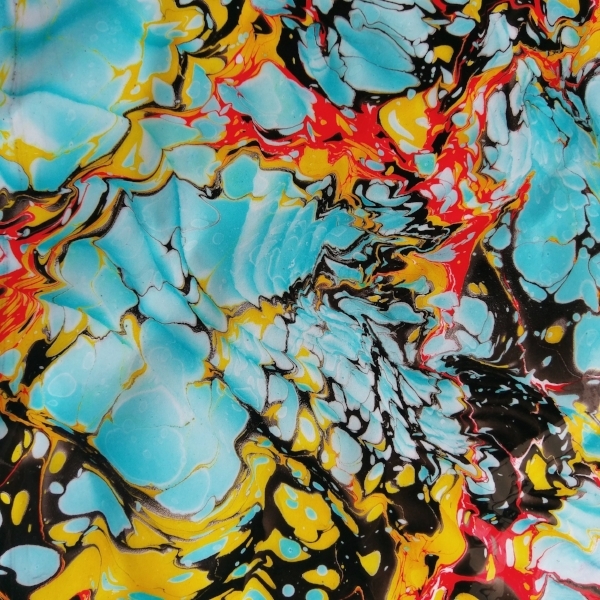 This particular piece is one of my favorites and was the first where I incorporated my "paint slide" into my spray paint, hash mark, and marbling layers. It's a complex piece that offers up so much texture and depth. 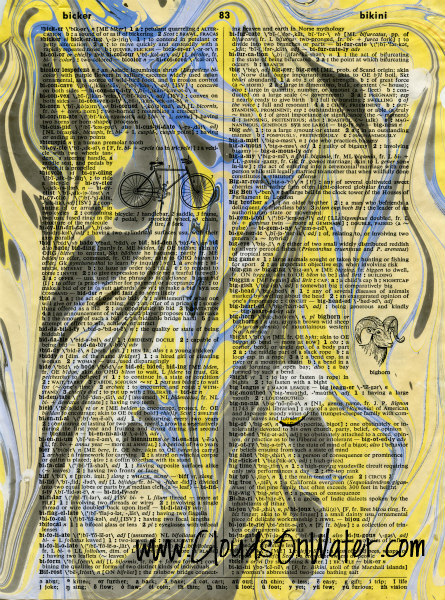 The piece is untitled because I want viewers to experience it uninfluenced. However, I will share with you that when I was working on it (and as I step back and take it in now as a finished piece) it became a representation of the emotional work surrounding my relationship with my parents and their relationship to one another. "Complex," "textured," and "depth" are appropriate words for nearly everyone's relationship with their parents, right? I'll be at the artist reception on May 4 and am so looking forward to seeing the collective group work hung in the gallery. I would love to see you there and experience the show together. Artist Reception: May 4 from 6:30 p.m. to 9:30 p.m. The past four months have been quite a ride for me. I wrapped up my ELEVATE mentorship program, spent the month of January in Minnesota caring for my mom at the end of her life, pulled together my pop-up show CELLULAR STORIES, and have just finished a week of group and private lessons. Whew. It’s about time for a break, don’t you think? 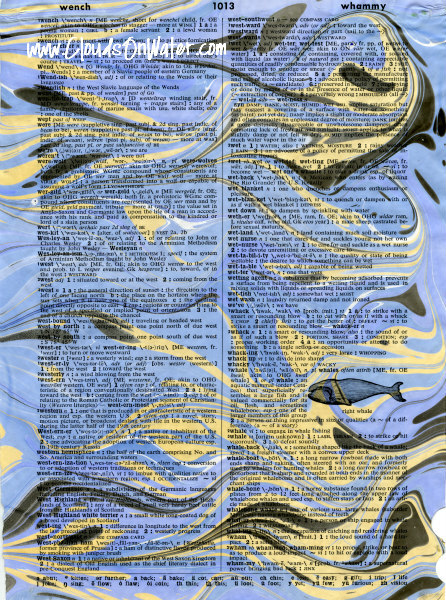 So, over the next three+ months, I will be participating in the The 100-Day Project, a global art project that anyone can participate in (even you!). The premise is simple—choose an action you’d like to do for 100 days and share your experience. It could be something creative like photographing flowers, drawing stick people, or making a collage. Or something inspiring like writing letters, reading to a child, or going on a nature walk and learning a new bird call. It’s totally up to you. There are no hard and fast rules. In fact, make up your own set of rules if you want to and do your thing for the next 100 days. 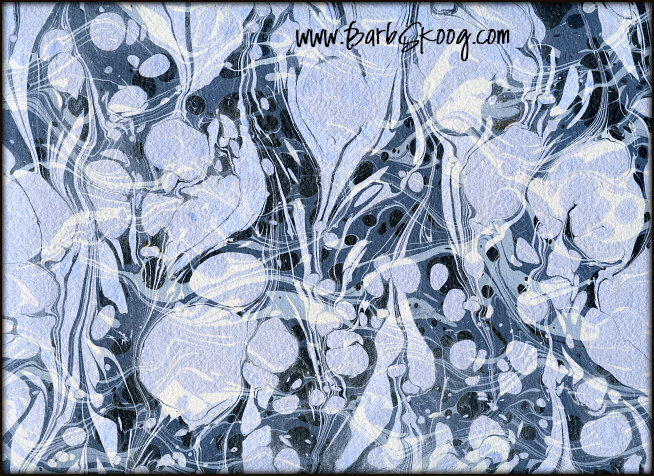 My plan is that over the next 100 days, I will be posting my progress/sketchbook/artwork/experiences/experiments daily on Instagram (@barbskoog and #100DaysOfNavigatingCuriosity) and Facebook and weekly summaries here on the blog. I would love to have you join me on yet another adventure. Here I go…the fun begins tomorrow, April 4. So this is a new adventure for me! I just got this 5ft. x 7ft. stretched canvas and I am SO excited to have a go at it. Not only has it been a while since I've worked on canvas, but this is the LARGEST I've ever worked before! It took me all of 30 seconds to dive into this new blank page and let me tell you...holy moly, is it FUN to work this big! Below are some WIP shots. I am nowhere near done. I'm still layering at this point, lose and free with the direction, not refining. Incorporating some of my Cellular Stories techniques and trying out new ones. Making observations and taking lots of notes. This is what I call "enjoying the ride." Preparations are in full swing for my pop-up exhibition/open studio this Saturday. My mom would be so excited for me. This show is dedicated to her and will be infused with her vibrant energy and boundaryless love. I look forward to welcoming you into it. Open House: 1 p.m. – 5 p.m.
Another highlight of the ELEVATE mentorship program was watching my fellow artists creatively evolve over the course of the four months ~ becoming stronger and more confident in our work not only because we understood it better but also because we understood ourselves better. Our time together during the program was punctuated with mini revolutions of the personal, emotional, and spiritual kind. And the support we gave each other only fueled the awakenings within us. So much gratitude to David (our fearless leader), Deanna, Beckie, Kathy, Karen, and Farah for inspiring me in my heart and in my hands. As with any journey, who you travel with is more important than the destination. 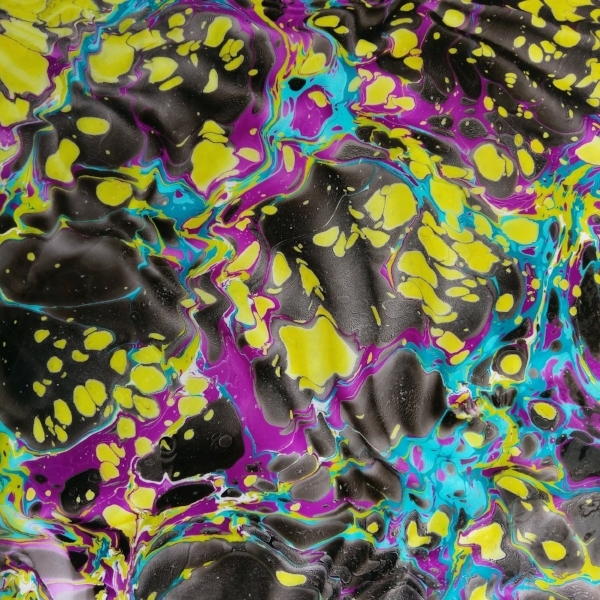 Untitled (detail); spray paint, acrylic, marbling on wood panel. 20"x20"
Ahhh....this piece. This was a tough place to get to. Lots of starts and stops, jumping off cliffs, and slogging through uncertainty. Lots of variations on process. But I kept showing up. Every day. Every day, I stepped into the studio. Every day, I picked up my tools. Every day, I committed to riding the wave of momentum. And every day I listened to my heart. As I made my way through pieces, I could hear whispers of stories coming from them. Some stories felt fresh and new. Others, old and vaguely familiar. These stories wanted to be told. I wanted to tell these stories. Cellular Stories is a body of work honoring my voice. It is the uncovering of ancient knowings within myself. It is the recognition of my ancestors’ truths, the narratives of which make up the blood and tears within me. I rarely title my work. I like the viewer to interpret their reactions without influence. However, during my Open House, I'll be giving a talk about some of these stories and how I used process to get to them. Detail. Charcoal, acrylic and marbling on paper. I will admit that when I first considered the idea of participating in the ELEVATE mentorship program, I was hit with a wild extreme of emotions. The idea of a mentorship, especially under David whom I respected highly, was exhilarating. I knew that between his expertise and encouragement and my no-excuses work ethic, something really good would happen. At the very least, I would end up with some strong guiding principles and a lot of good sketchbook starts. You know what? I took the chance, committed to the program, felt all those things all the time (exhilarated, scared, nervous, excited, motivated, uncertain, driven...), and came out the other side stronger and more grounded, more clear about my work in a series, and fiercely protective of my creative time. The image above, from the Cellular Stories series, is a small detail of a larger piece I don't actually like. I won't say the piece is a failure, but it's definitely not doing it for me. I can't seem to find my way into or out of it. I'm totally lost. But rather than shut down or feel a sense of frustration with it, I see it as a curiosity. And that's what the mentorship program fostered within me...a desire to know more. And then to honor that desire. Feed it. Fuel it. Never let it go. Just because my mentorship program has come to an end doesn't mean the work I began in the program has. The above image is a glimpse of one of the pieces I am working on in the studio these days (and hope to have finished in time for the Open House!). It is one of many in pieces in the Cellular Stories series that continues to emerge from a lot of hard work, trusting in the process, jumping off cliffs, and riding the momentum. That is, after all, the greatest takeaway from ELEVATE: confidence in myself as an artist. This is another piece that is a WIP. I'm not a collage person...I generally avoid it like the plague. However, another artist in the group was doing some amazing things with collage that really impressed me, and I saw how it could be used as a tool to express exactly what I was trying to express. I'm not sure I'm there yet with this piece, but it has stirred something in me. And that's all that counts. I invite you to the Cellular Stories Open House to see where these pieces are at...or where they lead me to. It's always a journey.